Khombisa Media, an airport billboard advertising company, has added R30 000 to the purse, specifically for the women’s categories, with R25 000 added to the first women’s team overall and R5 000 to the first solo female. "I love the Cape Pioneer Trek, from the way it’s managed to the community involvement, to the amazing route. This year I will be competing in my fourth. But I felt that the top women needed a better financial reward so we have contributed specifically to the women’s prize purse," said Theresa Horn, owner of Khombisa Media. "Obviously all the top riders prepare very well for this race but it’s usually harder for the women to prepare, especially if they have a family. So this is our way of recognising their sacrifice and efforts," added Horn. Bridge, the title sponsor, has also boosted the prize pool by adding R12 000 (US $1 200) to the highly anticipated Stage 2, which finishes at the summit of the Swartberg Pass. The total purse just for this stage now stands at R112 000 (US $11 200), the richest stage in the any mountain bike stage race. "Every participant is important to us and we want them all to leave the race with a sense of satisfaction," said race director, Henco Rademeyer. "Even though the bulk of the participants will not have podium contention ability, we feel that the top riders at the Bridge Cape Pioneer Trek deserve to be rewarded appropriately. Next year the prizemoney will get even more of a boost in line with the event becoming an International Cycling Union (UCI) graded race," added Rademeyer. Another innovation, which will be in place this year, is the free transportation of participants’ bicycles to and from the start and finish of the Cape Pioneer Trek. This has been made possible by logistics partner, Aramex and bicycle partner, Giant. Participants can drop off their pre-packed bikes at one of eight Giant retail stores around the country and Aramex will have them transported to the start and back to that store after the completion of the event. The stores are: Morningside Cycles (Johannesburg), Linden Cycles (Johannesburg), Bruce Reyneke Cycles (Pretoria), Cycle Sphere (Durban), Recycles CT (Cape Town), Olympic Cycles (Cape Town), Action Cycling (Port Elizabeth), Cyclotech (Bloemfontein). For a full list of contact details, visit www.capepioneer.co.za. 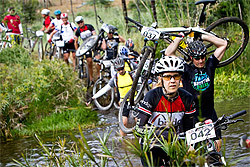 Limited entries are still available for the 2013 Bridge Cape Pioneer Trek. Entries will officially close on 15 September. The 5 most important food crops in the world are rice, wheat, maize (mealies), potatoes and sorghum. Four of these are grasses and one, sorghum, is indigenous to Southern Africa.